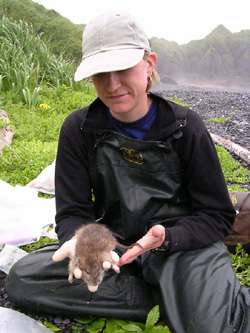 Graduate student Carolyn Kurle holds one of the many rats of Rat Island. The rat was trapped and anesthetized as part of a tracking study. Photo by Shauna Reisewitz. The study, published the week of February 25, 2008, in the Proceedings of the National Academy of Sciences, has already helped make the case for the first major rat eradication effort in the Aleutian Islands. Planned to begin this summer, the project will target rats on the appropriately named Rat Island. The Aleutian Islands are part of the Alaska Maritime National Wildlife Refuge managed by the U.S. Fish and Wildlife Service (USFWS). Kurle's research was supported in part by grants from USFWS and the National Science Foundation and by an EPA STAR Fellowship. Note to reporters: You may contact Kurle at kurle@biology.ucsc.edu and Croll at (831) 459-3610 or croll@biology.ucsc.edu.